Just as the waste and recycling industry was starting to make some adjustments to comply with China’s recently enacted waste import ban and contamination standard, China's Ministry of Ecology and Environment (MEE) announces plans to ban 32 more types of solid waste by the end of 2019. 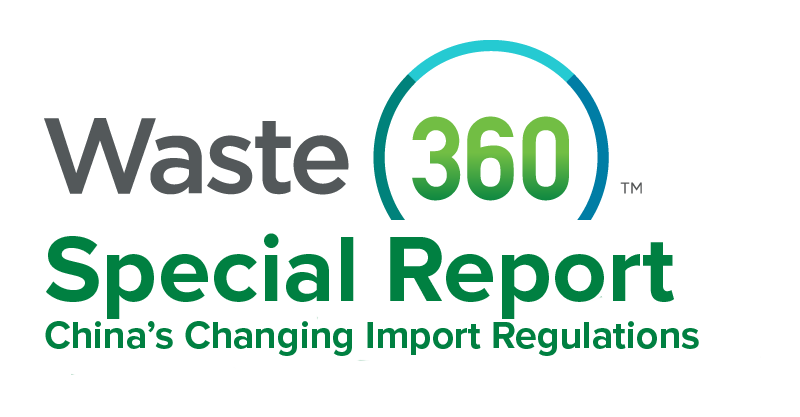 Sixteen types of solid waste, including compressed car scraps and scrapped ships, will be banned from import beginning December 31, 2018, and another 16 types, including stainless steel scraps, will be banned beginning December 31, 2019. This move sparked a reaction from three major waste and recycling associations—the Solid Waste Association of North America (SWANA), the Institute of Scrap Recycling Industries (ISRI) and the National Waste & Recycling Association (NWRA)—which have recently submitted a number of filings and feedback regarding China’s intentions. The Chinese government has made it clear that they will continue to ban additional materials. Therefore, it’s not a complete surprise that they have released a new list of banned materials. NWRA members collect mainly from residential and commercial businesses whose recyclables cover a range of different materials. Most of the materials identified on the latest list are industrial in nature and are unlikely to directly affect most of our members. However, there are references to some PET and polyethylene materials. While post-consumer plastics were banned in the previous iteration of the ban, there was potential for processed post-consumer plastics to continue to move into China. This ban might obviate that option. In addition, indirectly, these restrictions could upend existing markets for these materials resulting in additional market turbulence that could impact our members. ISRI President Robin Wiener also commented on the announcement. The associations will continue to follow this development and its impact on the industry as we progress further into 2018 and beyond. They are committed to working closely with governments, stakeholders and the public and private sectors on education efforts, contamination reduction efforts and finding new homes for these banned materials.